My first taste of Running Wild was a few months ago with their compilation album 'Riding The Storm' which was a real mixed bag and although their early material left me cold, their more commercial stuff was much more intriguing. 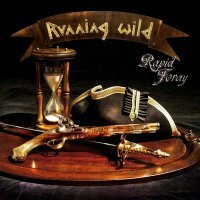 So when their brand new album 'Rapid Foray' landed in my lap I was intrigued to hear how the band sound in the modern era! RW were one of the innovators of the whole Pirate Metal sub-genre and with this album they do go nautical on us on a few tracks, but on the whole it's not overly invasive as, to be honest, I really can't take to the Pirate Metal sound so this is a massive plus for me. They have modernized their sound too, it is still Running Wild and that old-school Metal vibe, but they have evolved with the times and have naturally incorporated Power and Speed Metal into their song-writing. They haven't changed so dramatically that established fans will be disappointed, but they will appreciate the band's sound having a more current vibe and not feeling like this is a retro release. There are some commercial songs in the mix and on the whole it is a far more accessible album than I found 'Riding...' to be. I'm sure this is an album that will go down well with old-school Metal fans, but I'm confident that Power and Speed Metal fans will also be attracted to this release as well. It's a decent enough album and, in my opinion, far superior to their previous output, but I find the choruses don't stay with me and it's the guitar work that's keeping my interest. There is some simply stunning guitar work throughout, with some killer melodic licks, fast but still melodic solos and riffs. It's that which compels me to repeat songs and it's this aspect of the music that really shines and should really make fans of Metal guitar riffs very happy. As you'd expect from these guys, there is a heavy dose of gang-shout choruses and thunderous fast-tempo drums and bass as well as infectious fast-paced Metal guitar riffage. There is some diversity in the mix as well, with 'Stick To Your Guns' being more Scorpions style Heavy Rock and the impressive 'Into The West' having a slight Folk edge to it.